Tour de Cure 2013 /Hawks Aloft Inc. 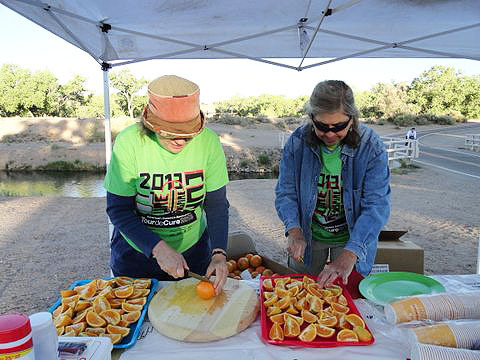 Here, Laurie and Consuela slice oranges for the riders. We also provided granola bars and water. The riders were doing a 100 mile, 100 km, or 25 mile ride, depending on their stamina! 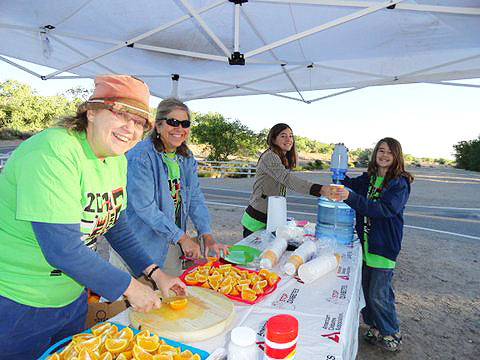 We manned the first break station about 10 miles into the race where all the riders passed by our station. Brandon and Rhianna enjoyed handing out water cups. 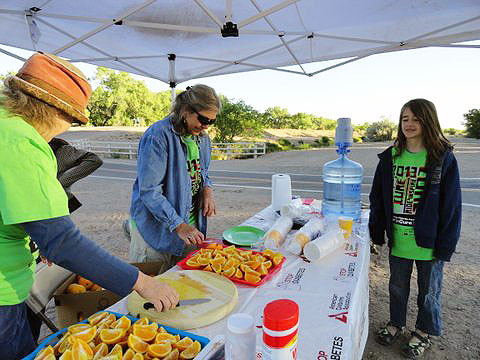 We brought along two of our educational birds, our American Kestrel and Western Screech-Owl, and talked with some of the bicyclists – the ones that needed a break after 10 miles, and other passers-by about the birds. We were there for about 5 hours, we had a great time, and it seemed like the cyclists did too. Hawks Aloft members Ed and Mary Chappelle rode the metric century (100 km or about 65 miles) and found the HAI water station to be just what they needed! It was HAI board member Mary’s idea to combine two organizations with which she has volunteered and supported — American Diabetes Association and Hawks Aloft. She wanted to support the ride and get out a little information about HAI at the same time. Gail thought it would be appropriate for us to work the station in the bosque, as that is where we do so much of our work. Many thanks to Laurie, Consuela, Liz, Brandon and Rhianna for their hard work and also to Laurie for the photographs.